I generally like writing reviews like the one below for Nattfog, because things come into clear focus pretty early and describing the album like Mustan Auringon Riitti becomes a pretty straightforward task. It is those unmistakably Finnish cool rustic folky swampy riffs which went into the foundation of this record, and the duo of Destruction and Adelwolf play them over and over again to have those riffs engrained onto every fiber of your body by the time the album is over. Such approach represents both positive and negative for Nattfog. If you are into melodic black metal Finnish style Mustan Auringon Riitti is an immediate draw, however, several tracks into the album you will know exactly what happens next and the intrigue is lost. Unlike some more poppish Finnish acts, like Catamenia, Nattfog is a lot closer to more archaic sounding bands, like Thy Serpent, with an occasional moment of both Horna and October Falls. To listen to these jangly detuned riffs (Path of the White Wolves, Reaching to the Stars) is to take a trip to the Land of 10,000 Lakes, but, again, there are only one or two of them per song, repeated ad nosium, and that is obviously on purpose. The title track tries to use double bass and an occasional drum roll to get it going, but the song never completely develops. Epic and steady Kosmisen Usvan Ymparoimana and prehistoric tribal instrumental Kaksitoista Askelta Luvattuun Valtakuntaan, are where stagnation is the most obvious. 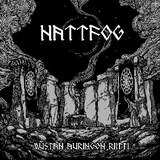 Nattfog does significantly better when after repeating their verses several times they break out with an extended shamanistic dancing melody towards the end of Path of the White Wolves, or pick it up with another banner melodic moment at the conclusion of Reaching to the Stars. In this regard Mieleni Mustissa Merissa stands out as it delivers something both heroic and hurtful, grinding along with reverberating guitars, presenting the best melodic hook of the whole album. Steady and enveloping, the song, nevertheless, has its obvious climaxing moments. As much as my head was bobbing along to the sounds of Mustan Auringon Riitti, I am afraid that an album like that will not stand up to repeated listens, its predictability inevitably pushing the sounds in some sort of fading background, where you throw this on while doing something else. Perhaps this would have been better off as an EP, where the better moments could have been culled off, the songs shortened (like maybe in half), so the ideas presented do not come off overstretched and milked for everything they got.